Someone wrote to me "The harder you try, the more difficult it becomes to forgive and the more you try to forgive the more others do things which make you change your mind. I don't know what is right." Another said, "How do I forgive? It is so hard to do so." Another said, "I have forgiven but the other person has not forgiven." Yet another said, "How do I react when I meet the person who caused hurt to me and I have forgiven?" Yeah, I put all that in red as it is an alarming situation. In the past few days there have been questions in the similar line. Why I put up this question and the article following it here is because many face this problem of forgiveness. Some find this topic or subject itself boring as who has the time to think about it all? Some feel they have better things to do that to think about forgiving all and all that comes with it. Some feel that the people who brought them so much of problems or suffering cannot be pardoned so quick. Some think this is only saintly business and all these saintly topics and acts are only limited to saints or scriptures or religious texts. Forgiveness is not something that you give to someone else but it is what you give to yourself. Forgiveness is not a saintly business, it is all about your own daily business. (Saints always thought about others/you; that shows the significance of their teachings). By forgiving you are not helping others you are helping yourself a great deal. Instead of focusing on how others would benefit with your forgiveness, you will know how you have benefited yourself by forgiveness. First, you have to understand what is forgiveness and what is it that you need to forgive. Once you understand and put to practice these things, you will notice that forgiveness is not as hard as it looked. Firstly, you have to re-look into these myths. "It is not easy to forgive." It is very easy if you learn the art of letting go and releasing. Forgiving means detaching or letting go or releasing that emotion within you that excites so many other emotions like fear, ego, anger, guilt, etc. So one must understand that the feeling of resentment is what has to be released to forgive. Resentment is that emotion that got caught up within you while the other person caused you harm. This emotion is the real culprit not the person. We actually cling on to the person. For if it is anyone to blame, blame yourself for holding on that thing deep within you which is so harmful. You are unknowingly giving birth to many other negative emotions and thus giving rise to disease of the mind and body. So, you feel it is not easy to forgive because you are holding on to the person and every time you think of the person, you feel more angry, etc. Long suppressed ill feelings or anger and resentment eventually lead to cancer. If you cannot release it, your body will try to release it in its own form and thus erupt in a disease. So how do you prefer to release?? The understanding and knowledge of what problems nonforgiveness can bring to you itself will make you want to drop that resentment you have held so dear. "It is embarrassing to go and ask for forgiveness or I am scared to ask for forgiveness." You don't need to confront the person whom you have to forgive. Forgiveness is something that you practice on yourself. If you are able to silently release the guilt or ill feeling towards that person, you have forgiven. If possible to confront and express it out rightly, then it will help a great deal because you are doing it with mind, body and soul. But if you feel this is not possible due to some reason, then master the technique of release the emotions. Meditation helps a great, great deal in this, where you sit in quiet in meditation. "I have forgiven but the other person has not." It does not absolutely matter what the other person is up to. It is their life agenda and their problem. There are methods which work on both the parties involved. Meditation and visualization. Keep visualizing and feeling truly that you are sending love to that person, hugging that person and that person also is loving you in return. In the start it may not be easy but eventually your mind will catch up and you will see it becoming easier. What will follow next may be unbelievable but with time you will notice that the person who did it to you also is able to oversee this problem between you and him/her. This happens by The Law of Attraction. The ultimatum here however is not on the other person but how you release that emotion from your system. "The harder you try, the more difficult it becomes to forgive and the more you try to forgive the more others do things which make you change your mind." Here the focus is on someone else's plate. These are all similar problems in life where one wants to forget someone but cannot, one wants to forgive someone but cannot, one wants to keep off a bad habit but cannot, one wants to practice meditation but cannot, one wants to change diet for health reasons but cannot, one wants to achieve something but cannot, and the list is endless. Why is this? Because the focus is not on what you want actually but it is on what you don't want. Likewise, when you want to forgive you are focusing on the person and they did to you all the time. Anytime and every time you think of the person all those horrific memories unwind in front of you and you undergo the same trauma in the present that you experienced in the past. What you are doing is actually re-living those moments and feeling all those bundle of negative emotions all over again to throw you into turmoil and make it even harder to get out of it. That is why you feel it is becoming harder. Release. Let go. Unclutch. All those memories and hurt are nothing but your ego that is being hurt again and again. "How could he/she do this to me?" "I have been taken advantage of." " What happened to me is not justified." You may have thousands of reasons but know that nothing in life is injustified. Everything has a valid reason. Knowing the Law of Karma will clear this. It is my personal experience that with understanding of the Law of Karma only I have been able to let go of a lot of things in life that does not hold right for my highest good. The person who hurt me is now in peace because I have forgiven." This is such a foolish statement and expression. One is not at peace because the other is at peace! All these are only the conceptions of your mind. Mere imaginations. This would mean that the forgiveness has not taken place because the focus is still on the person and not within. In fact, with real forgiveness one will be more calm and at peace. In actuality, when you forgive and are at peace it is other person who may not be at peace. See, the very intention of someone try to hurt you is to see you unhappy and if you are happy you have not let them do what they actually wanted :) With practice you will not entertain the thoughts of that person and even if the thought comes one one will feel love and at ease. When this happens know that you have truly forgiven. For forgiveness goes hand-in-hand with acceptance and unconditional love. This is something that is practically difficult but not impossible. That is what is most important that anything else. Refuse to take in anyone's hurt. It is always the mind that creates and mind that suffers, nothing else. So give the mind some rest. I believe, you must be having better things to do in life than to keep thinking of the person who wants to see you unhappy. This is why all saints and masters of all religion preached and practiced the art of forgiveness. They are not mere dogmas or doctrines to be followed only in church or temple or mosques, but to be made a part of daily life. Christ while being tortured and killed by the Romans simply did not look up and say, "Father, forgive them for they do not know what they are doing." It is what came naturally to Christ through the power of unconditional love. The best weapon to dissolve resentment is unconditional love. Loving everything that comes your way. 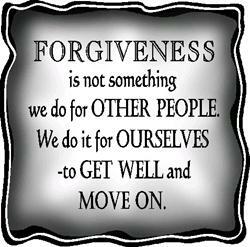 If this is practiced and master much more can be achieved than just being able to forgive. To conclude, forgiveness is not difficult. It is the best thing that can happen to you and your growth. Put it into practice than just point fingers at someone else. You are responsible if you allow external negativities to enter within you and start dominating you. Love, accept, forgive. Mastering this you have mastered a great aspect of yourself knowingly or unknowingly. Great Work, Jacob! Very nicely written. Was very useful.